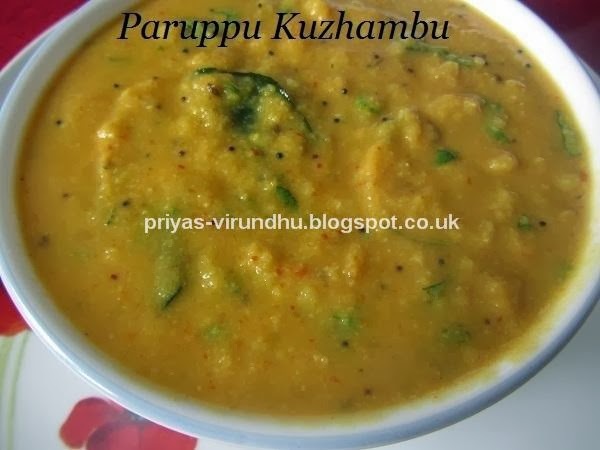 Paruppu Kuzhambu/Dal gravy is a very traditional and authentic kuzhambu prepared in all most all the houses in Tamil Nadu. 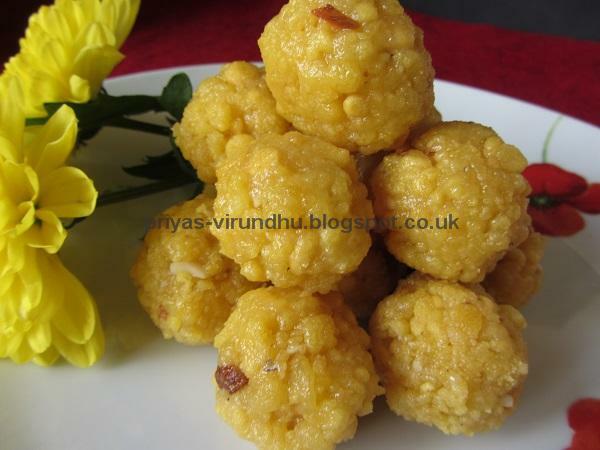 This paruppu kuzhambu is my grandmas recipe, who was from Nagapattinam, which my mom makes quite often. 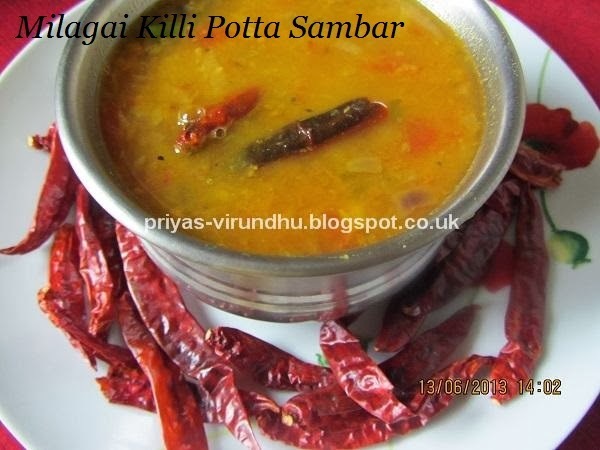 Paruppu kuzhambu is different from sambar, because it is made without using sambar powder or chilli powders. 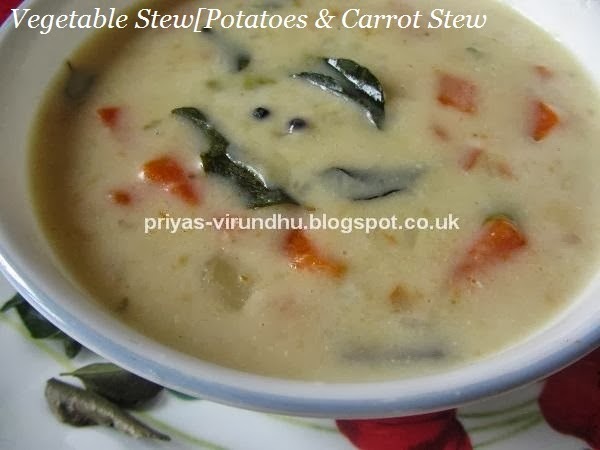 It is very flavourful and thick in consistency because of the garlic and ground coconut paste or coconut milk. 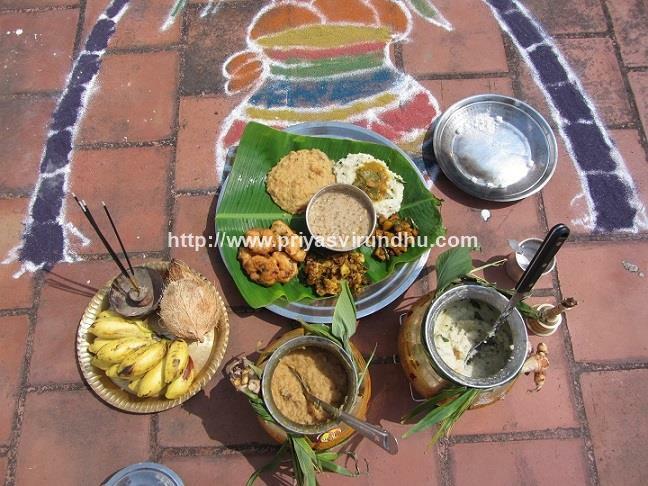 This same paruppu kuzhambu is prepared differently in each district of Tamil Nadu with slight changes in the recipe. 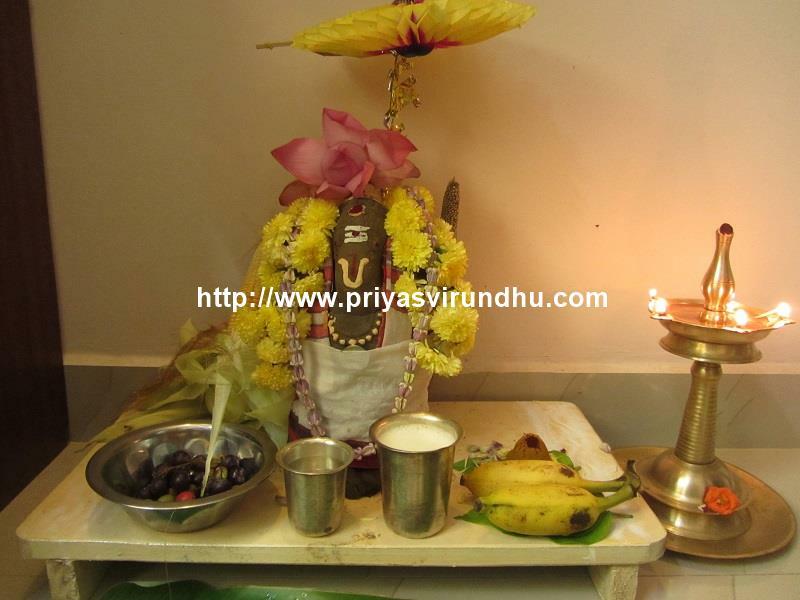 Here’s how to make Paruppu Kuzhambu with step by step photos…. Paruppu Thakkali is a very healthy and yummy dal that can be prepared very fast and served with white rice & ghee or idlis, chapathis and rotis. 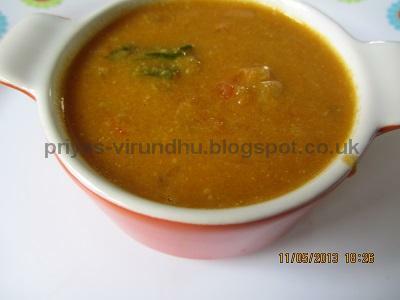 In this dal we do not use tamarind instead the tomatoes give the sour taste and balance the taste of dal. Tomato kurma is a typical South Indian breakfast side dish for dosas and idiyappams. 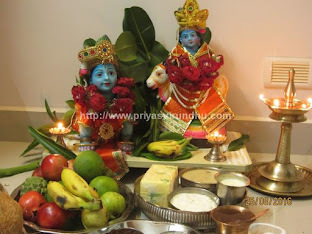 I still remember my mom making this when we have unexpected guest and serve them with dosas or puris. 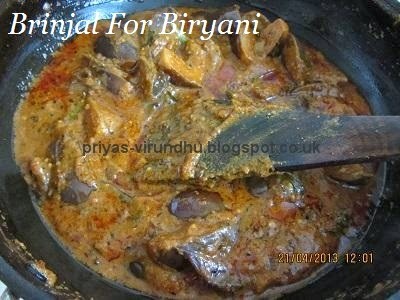 This can be made very quickly and needs very less ingredients and also totally packed with vitamin C.
Biryani kathrikkai as the name says is a perfect accompaniment for biryani’s. It is usually served in all the marriages and restaurants. 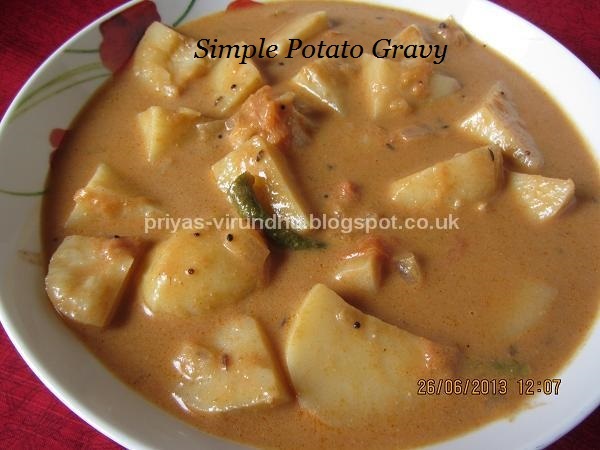 I have tried different versions of this same gravy but finally settled down with this one which has satisfied my family and friends taste buds. 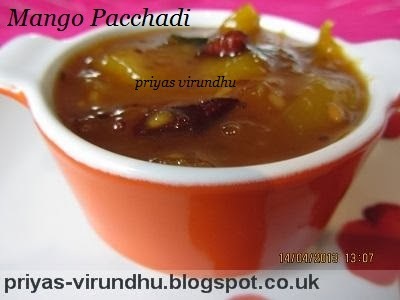 Mango pachadi is a must on Tamil New Years day, it is so special because it has all the six taste “arusuvai” [Innipu, uppu, pullippu, kasappu, urrapu and thuvarpppu]. Aviyal is one of my husband’s all time favorite dish. 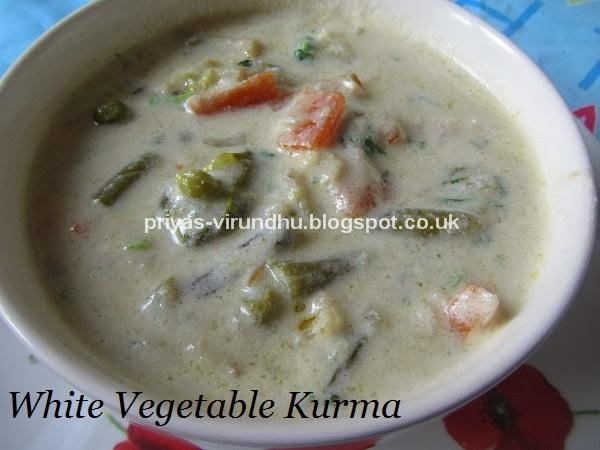 It is one healthy dish with lots of different types of vegetables. Today when I was looking in my refrigerator to make something for dinner, I found only few beans, 2 carrots and all other vegetables only very little. 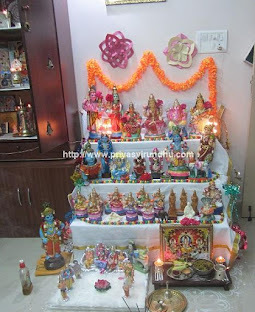 Then I thought, yes I can make aviyal. 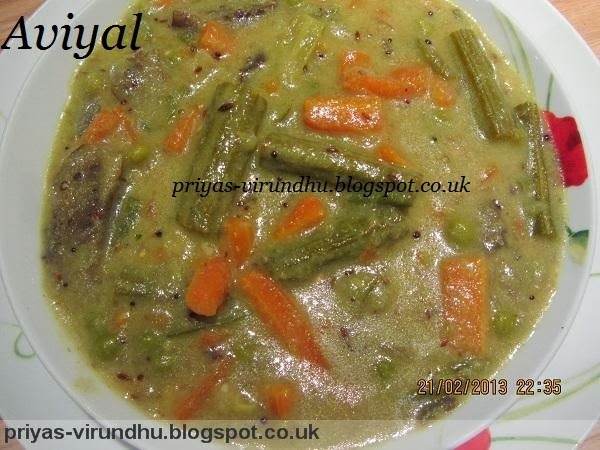 Aviyal is a traditional dish from Kerala. It is very easy to make and has extraordinary taste and flavor.